The legend of Duncan Edwards was a short time in the building but, as long as men gather together to kick a football, it will never die. Duncan was a Soccer titan, a once-in-a-lifetime phenomenon who thundered on to the First Division scene in the early 1950s and was snatched away just five years later, leaving the football world aching for what might have been. He had been in the United side at 16, the England team two years later, and there seemed no limit to what he would achieve. 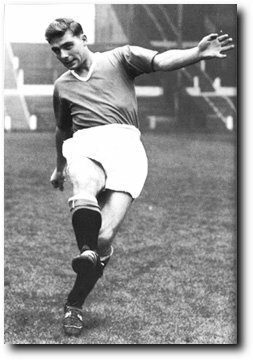 Duncan Edwards was that hitherto mythical being, the complete player. There was nothing that could be done on a football field that this young giant couldn't do better than anyone else. His ball control, with both feet, was masterful; his passing and tackling were exemplary; his shooting was awesome, both in power and accuracy; in the air he was a king; his reading of the game was startling in its maturity. The catalogue of his playing attributes was comprehensive. And that's barely the half of it. Then there were his bravery, loyalty and dedication, and - perhaps the most crucial of the lot - a temperament that ensured he would never squander the gifts with which he was so bounteously endowed. From the moment he arrived at Old Trafford, there was no doubt that Duncan was going to be very special. He was aware of this himself but was not one to sit back and let it all happen. His devotion to the game bordered on the fanatical and he would often practice until the ball had to be dragged away from him. Duncan would have played all day for the love of it if he could and was the embodiment of the Corinthian spirit. Most of his games for United were at wing-half, a position from which he could lend his dominance to the defence but could also storm into the attack at every opportunity. Defenders seemed to bounce off him when he set off on one of those surging runs, an apparently unstoppable force. His last League match, the Reds' epic victory over Arsenal at Highbury by the odd goal in nine, saw one of his typical strikes when he arrived late on the edge of the penalty box to wallop a pass from Dennis Viollet past the Gunners' custodian, Jack Kelsey. When he died at Munich - after a courageous two-week fight for life during which he joked with Jimmy Murphy about being fit for the next game - he had won two Championship medals and had played 18 times for England. He was only 21, his vast potential barely tapped. Those who saw Duncan Edwards play will treasure the memory. They will not see the young leviathan's like again. Taken without permission from Hamlyn's `Manchester United Player by Player' by Ivan Ponting.